When some firms of a cartel cheat and produce more than their allocated quota, cartels fail to maximize their profit or surplus, while consumers benefit. Similar effects appear when more fringe (or noncartel) firms exist in a market, which is called an "imperfect cartel". Consequently, the cartel firms would welcome more fringe firms to join their cartel. On the other hand, when some firms have joined the cartel, other fringe firms would prefer to stay out: they can increase their production because of higher prices due to the cartel. 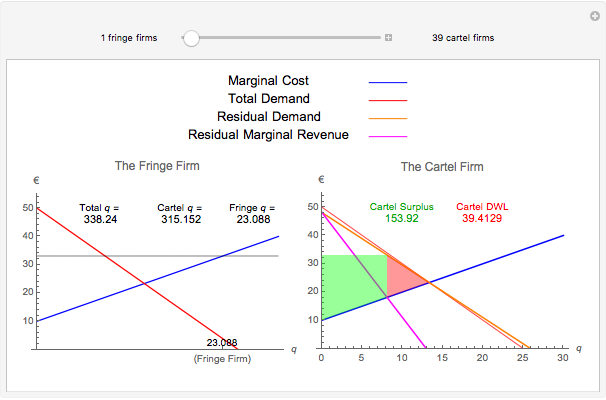 A numerical example (modified ), illustrates the effects of both the number of cartel and fringe firms. The market consists of up to 40 identical firms (without entry), with cartel firms and fringe firms, facing a linear demand curve, . The fringe firms are price takers, while the cartel behaves as a monopolist for the residual demand. 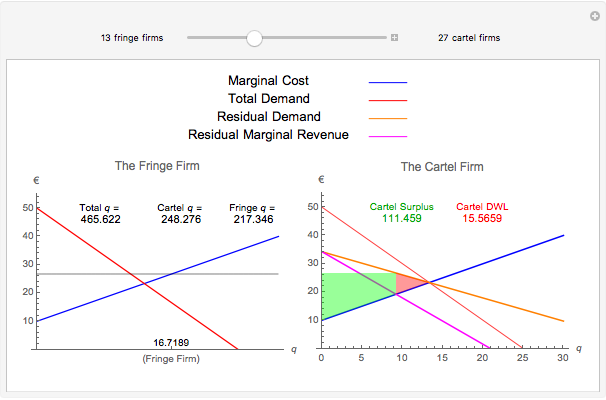 Both fringe and cartel firms' Marginal Costs are, . 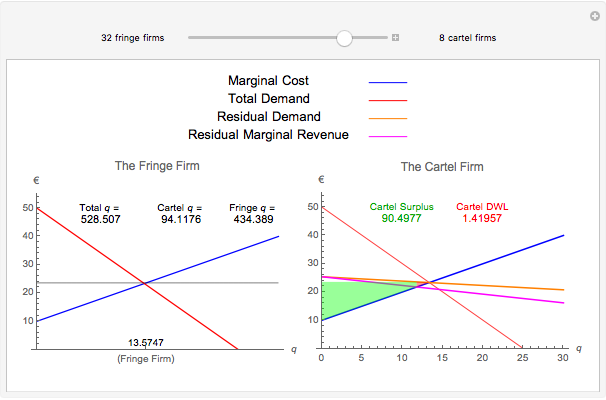 The graphic shows two representative firms, the fringe (left graph) and the cartel (right graph). The left graph displays also, the total production, the total cartel production and the total fringe production, as well as the representative fringe's production. The right graph displays the cartel surplus (green) and the Dead Weight Loss (red) from the cartel price. Notice however, that the Residual Demand is discontinuous below Ã¢ÂÂ¬10 and should be identical to the Total Demand, but that part is of no interest. D. Carlton and J. Perloff, Modern Industrial Organization, 4th int. ed., Pearson Addison–Wesley, 2005.